Four pieces of fabric for a blouse. As usual, I am juggling a couple projects. I put the Little White Dress aside to work on and attempt to catch up with the Free Marfy Pattern sew-a-long with Leisa on A Challenging Sew. January is the blouse, Marfy 1913. The pattern is downloadable and FREE. 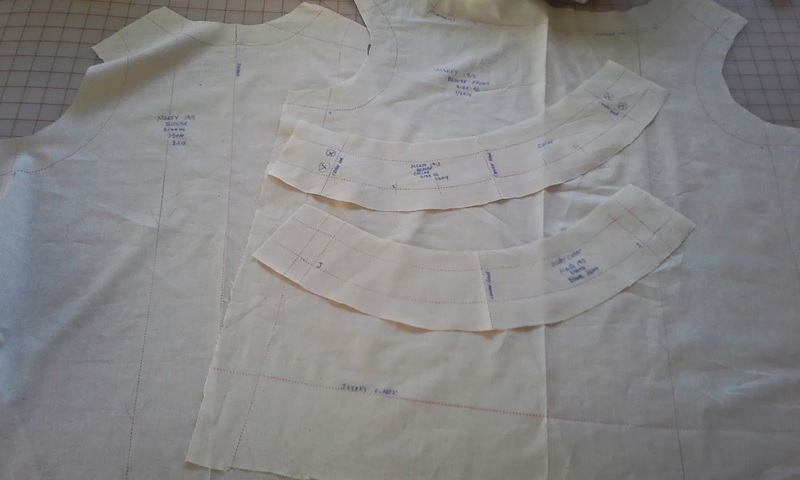 There are only four pattern pieces--front, back, collar and undercollar. 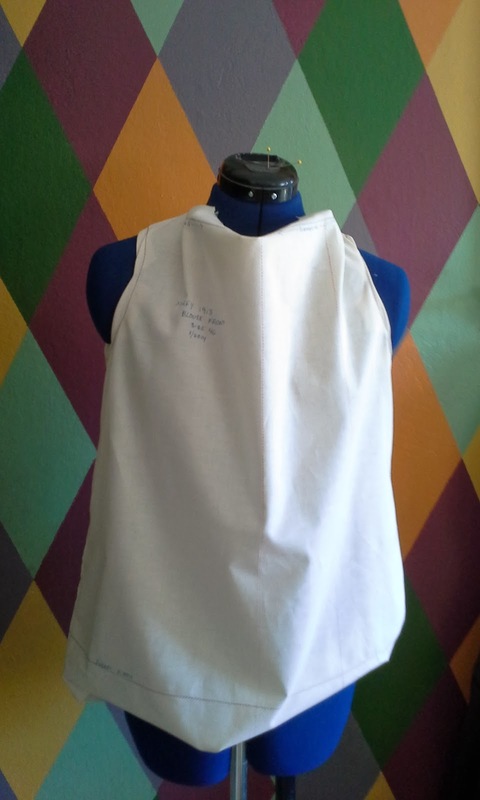 It is a sleeveless high neck that closes in the back. As much as I loved Leisa's many versions, this pattern really isn't for me, but I really want to participate and try the cool new techniques Leisa is teaching us. Unless I make some minor adaptations. I really don't look very good with a high collar. 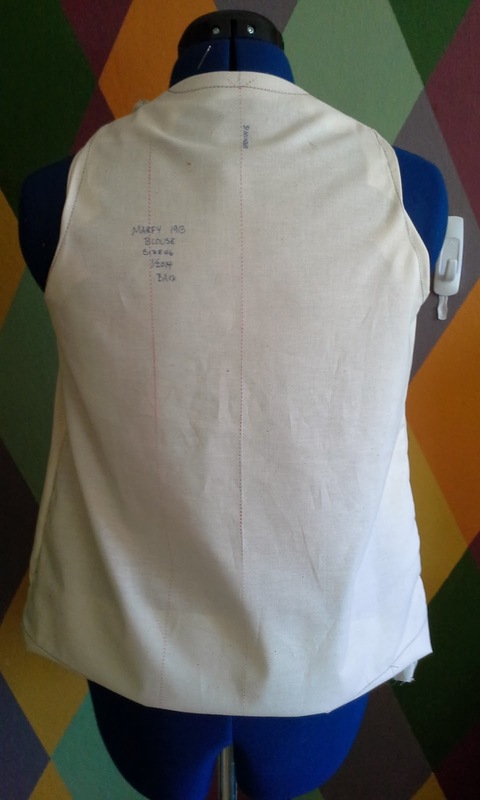 I am willing to do a higher neckline, but not adding an inch or so collar band. 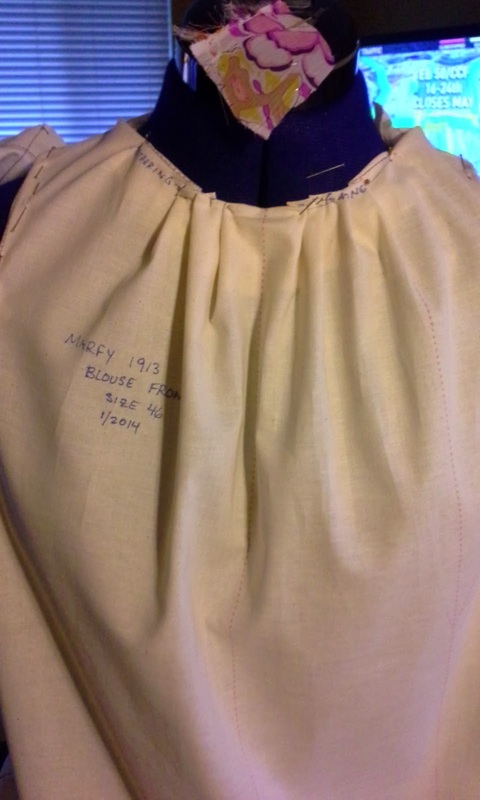 I made the muslin--simply a front and back, by using wax transfer paper to trace the seam lines from the pattern. Marfy patterns do not have seam allowances. I had to remind myself. Then I used my sewing machine to trace seam lines with stiches. 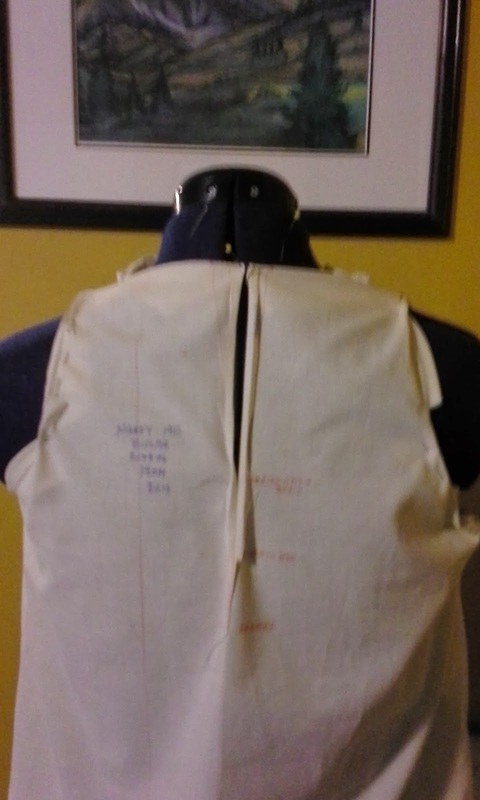 Finally, I stiched the shoulder seams and side seams. put them on Dorothy the Dress form. At this point it is hard to believe this will turn into anything. I tend to think of it as a sack. I turn everything in at the machine thread traced seam lines and pin them inside. It begins to take some shape. There aren't any openings decided on yet. So the back looks even worse than the front. Leisa has a number of ways to take in the excess in the front. I think I want pleats and try it. It is looking more like a lumpy gathering. I actually like the way it is looking. Now for the back. On the sew-a-long, Leisa is showing an opening used by Susan Khalje--I am in awe of Susan Khalje and wish to someday be able to afford an in person class with her. The opening has a very delicate and clean look to it. I had to try it. I planned to take a bunch of pictures of it, but I must have forgotten. I cannot do justice to the explanations given by Leisa, so here is her post on this opening. I can only show you how it looks on the muslin now. The main idea of the opening is to measure it like a dart. Mine is a 10 inch dart down the center from the neckline with one inch out from center on each side. it is still soooooo cool! The dart itself is sewn only from six inches to ten inch marks. Above six inches is not sewn. The "dart" is then sliced open from the neckline to the eight inch mark. This means that two inches of the sewn part is stitched. The sides are then turned and sewn like a narrow hem. It was amazing to see that it actually worked. And then finish my Little White Dress without starting any new projects.